- Got it through employee discount for $200. Even without the employee discount you can regularly find it for under $290 shipped. - Setup was pretty quick and simple. Just a few items had to be snapped in place and tape removed (from printer and each of the 4 toner cartridges). - You can connect either by usb or the built in 10/100 ethernet print server. Of course I went with ethernet. - There is a very nice embedded web server to manage all the settings of the printer (and there are a ton. Check out the user guide on the support site for details). Just point your browser to the IP of the printer. It uses DHCP to pick up an IP just fine (which I then reserved a static IP by MAC address on my router). - First I grabbed the latest drivers from the support page. I tested this printer under winxp only though I do see vista and vista 64bit drivers are available. 1) install the driver. this just uncompresses the files. It doesn't actually install anything at this point. 2) run the install network printer wizard. When you get to the driver installation part just choose your location and pick where the driver files were uncompressed in step #1. 3) After I confirmed everything was working I ran the firmware update. Just repeat steps 1 and 2 for every pc on your network. - Overall performance is pretty good. It's a single pass printer even for color (about 8ppm). Time to first page is about 20 seconds or so. Quality is pretty good. This replaced an ancient dying HP PhotoSmart 1100. Even on plain paper photographs looked better on this printer than my old 1100. Having said that I'm sure any modern photo inkjet would beat it. Still, not having to mess with expensive maintenance heavy ink anymore is a big advantage. - To give you a rough idea of quality here is the sample test page which I printed out and then scanned back in at 300 dpi. - Toner cartridges are expensive. Retail price is $75 for black and $83 for each color (yield is 2000 pages). Total price would be $324. Since this printer comes with full toner cartridges (none of that starter crap) it pretty much makes this a disposable printer since it's actually cheaper to just buy a new printer. Either way it's not that big of a deal since we won't be using it that often. I still have my samsung laser pinter for black and white jobs only. You can always go the ebay route to get toner too. I've refilled my samsung twice now and it's working great. Toner for the samsung was dirt cheap (around $10 or so). Of course you have to remember that the drum is part of the toner cartridge and after the second refill you will probably need to replace it. Looking around on ebay it seems a 4 color toner set with chips cost around $94 (black only around $45) if you want to go that route. You can also get a tool that will melt a 3/4" hole into the toner cartridge for easy refill. I have NOT tried any of this so I have no idea if this is a good idea or not. On the samsung it was really simple to refill (just a few screws). - The chip/counter isn't too big of a deal since you can override it and print until you are dry. - It's not too terribly bulky. It's pretty tall but the base isn't bad. It's about 40lbs. Overall I like the printer so far but I haven't used it nearly enough yet to pass any sort of judgment. But so far I like the quality, speed, and value. Either way I'm glad to be rid of inkjet forever! This printer is absolutely amazing - a true workhorse - you can send tonnnns of print jobs to this thing and it never messes up. 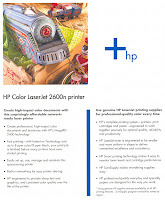 It's network-ready, and with new single pass, network-ready color laser printing, you get a lot of speed. It pumps out 21 pages per minute, both color and monochrome. Plus, thanks to its "no noise" print engine, it's super-quiet.